Following our retroscope series of latter years, here we go again! Here's Speakers' corner's cousin; From head to heart. Luna Kafé's focused eye on great events, fantastic happenings, absolute milestones, or other curious incidents from the historic shelves'n'vaults of pop'n'rock. Blowing our ears and our head, punching our chest and shaking our heart. Making us go sentimental, but not slaphappy. This moonth the Lunar time-machine juke-box touch down in the gothic, dark-wave post-punk shades of 1984. Let's dance. Death-dance. By 1984 4AD was one of the coolest independent record labels around. Apart from interesting music, the label was profiled by characteristic cover design where the outer and inner sleeves normally didn't include more written information than strictly necessary. The label even had some commercial success with the single I Melt With You by Modern English and the EP Sixteen Days/Gathering Dust including a cover version of Tim Buckley's (yes, the father) "Song To The Siren" by the house band This Mortal Coil led by the label's founder Ivo Watts-Russell the previous year, sung by Elizabeth Fraser from the Scottish 4AD band Cocteau Twins. By 1987 the label had gained new markets after signing American underground rock acts The Pixies and Throwing Muses and relapsed the no. 1 hit "Pump Up The Volume" by house pioneers M|A|R|R|S, but that's another story. Back in 1984 Cocteau Twins was the pets of a new kind of indie new wave/post punk act and label mates Dead Can Dance (DCD) followed suit. DCD was formed in Melbourne, Australia by Lisa Gerrard, Brendan Perry, Paul Erikson and Simon Monroe in 1981. 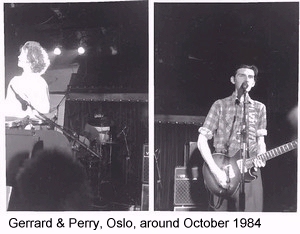 The former three moved to London in 1982 and gained a record contract with 4AD the following year. According to Wikipedia the eponymous debut album was released on 27 February 1984. The band's home page says 1 March. We go for the latter. For those who are familiar with DCD's later albums, the debut might sound as a bit of a surprise. Here are few traces of medieval chanting, keyboards, melodic and sacral moods. The album is dominated by new wave/post punk and early goth rock with lots and lots of reverb, and a bit of echo as well. Here are the traditional rock instruments electric guitars, bass and drums, and in addition Lisa's distinctive yangqin or yang chin, a kind of Persian or Chinese dulcimer. Also worth noticing; Brendan Perry seems to be the main vocalist. Lisa only takes the lead on four of the ten songs of the album. And it's not so much the melodies as the sonic landscapes. At the best, DCD manages to create spellbinding moods like the howling at the start of the opening instrumental track "The Fatal Impact" and some of the songs where Lisa's characteristic, sometimes high pitched voice comes to the fore. Brendan's vocals sound like a mixture of Ian Curtis (the late Joy Division front man) and Jim Kerr (ditto of Simple Minds, well, still alive). In retrospect the production, by the band members themselves, might seem a bit overblown, but they never cross that self indulgent line into pompousness that for instance Simple Minds and several others did around this time. And the songs where Lisa's voice and yangqin are at the front, still gives me the shivers. On a few occasions, like "Fortune" and the closing track "Musica Eternal", one might discern shapes of things to come. Especially the latter stands out; it's calmer, without any drums, more mellow and lingering than the rest. we suffocate them in an alarming embrace. But there is an interesting light-weight guitar and vocal break during "A Passage In Time", like the sun threatens to come shining through the thick clouds in an otherwise bleak landscape. A most welcomed contrast! Dead Can Dance, the band, lead by Lisa and Brendan, went on to different terrains, their music turned more polished and they found fame and fortune in the USA when 4AD secured a distribution deal with Warner Bros. there around 1990. The two of them was also a couple on a personal level, and the band split in 1998 after their relationship has ended. The band briefly reunited in 2005 and returned with a massive world tour in 2012. A live album from the tour cunningly titled In Concert was released less than a year ago. Dead Can Dance, the debut album, might not have stood the test of time completely. On the other hand it's a fascinating testimony of what was going on within the alternative music scene far removed from the pastel coloured commercial hit music of the mid 1980s. I witnessed both Dead Can Dance and Cocteau Twins live at a, to some extent, alternative hip club in Oslo in the autumn 1984. Whereas the Twins were quite charming (at least vocalist Elizabeth Fraser) with a touch of innocence, the Dead Can Dance members were cooler and kept at a distance to the crowd. Still, their set made a profound impression. I had only bought their second release by then, a 12 inch EP called Garden Of The Arcane Delights (later included as bonus tracks to the CD-version of the debut album), recently released at the time. The very next day I felt an urge to invest in the debut. It still gives me pleasure to listen to. Not only because of reverberations of a time gone by.